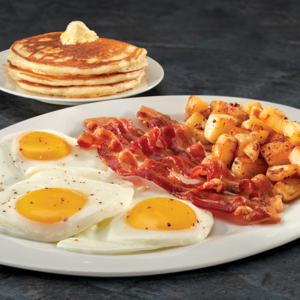 Three eggs any style, three strips of bacon or three sausage links and choice of hash browns or home fries. Served with toast and three pancakes. 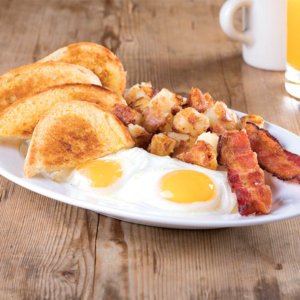 Two eggs any style, two strips of bacon or two sausage links, toast and choice of hash browns or home fries. USDA 7 oz. Choice Sirloin Steak, two eggs any style, toast and choice of hash browns or home fries. USDA 10 oz. 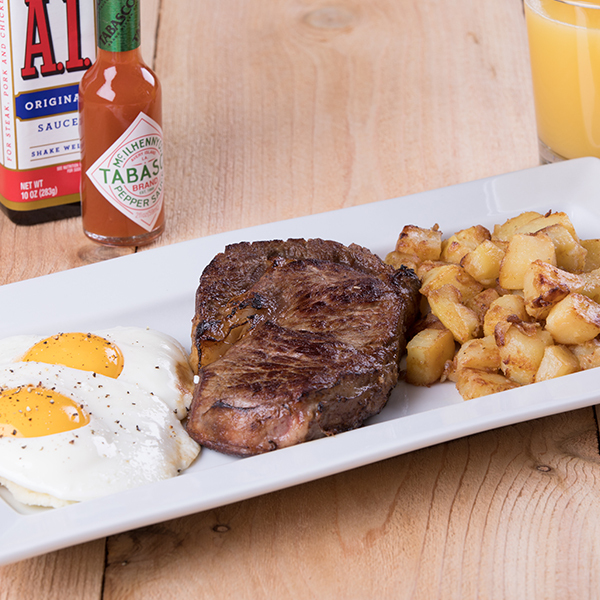 Choice Ribeye Steak, two eggs any style, toast and choice of hash browns or home fries. 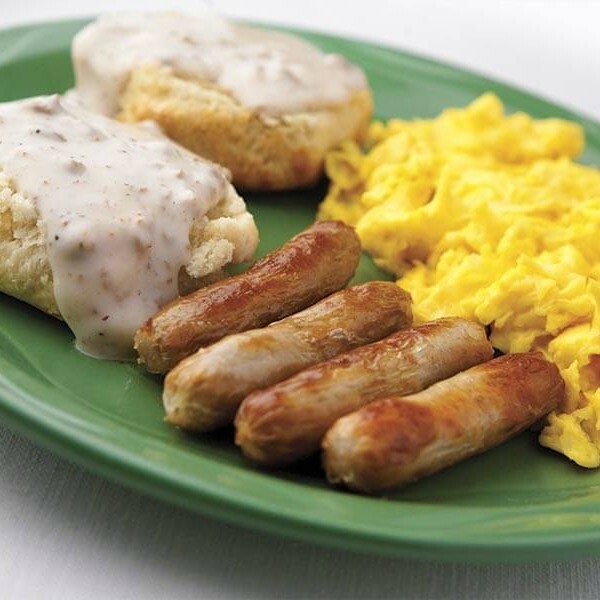 Two eggs any style, four strips of bacon or four sausage links and a biscuit covered in sausage gravy. Golden fried and smothered in sausage gravy. 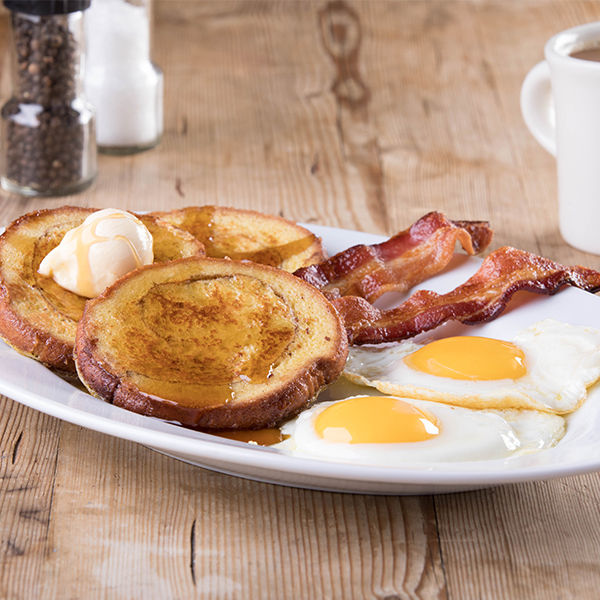 Served with two eggs any style, toast and choice of hash browns or home fries. 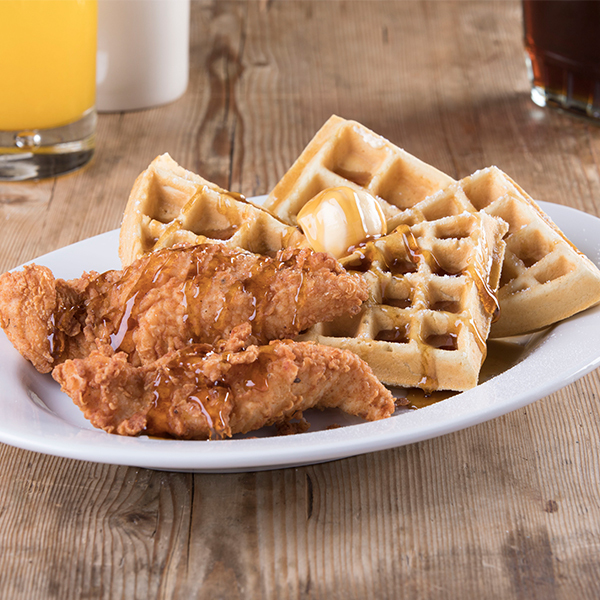 Served with hash browns, home fries or seasonal fruit cup. Two toasted English muffins topped with grilled ham, poached eggs and our house-made savory hollandaise sauce. 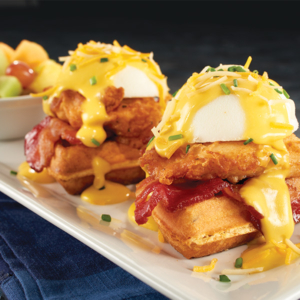 Two sweet poblano pepper cornbread waffles, hand-breaded chicken, bacon, poached eggs, shredded Cheddar Jack cheese, green onions and smoked cheddar hollandaise. 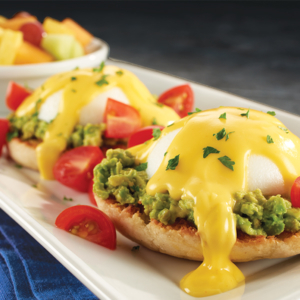 Two toasted English muffins topped with smashed fresh avocado, diced tomatoes, poached eggs and our house-made savory hollandaise sauce. Two poblano pepper cheddar grit cakes topped with grilled filet medallions, sautéed onions and mushrooms, diced tomatoes, green onions, poached eggs and smoked cheddar hollandaise. 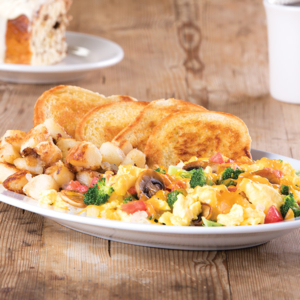 Served with toast and choice of hash browns, home fries or seasonal fruit cup. Substitute egg whites or egg beaters. Three eggs, diced ham, sausage and bacon with melted Cheddar Jack cheese. Three eggs with your choice of American, Swiss, pepper jack, provolone or cheddar cheese. Three eggs and diced ham with melted Cheddar Jack cheese. Three eggs, broccoli, mushrooms, tomatoes and onions scrambled with melted Cheddar Jack cheese. Light and fluffy pancakes, made from scratch, with buttermilk. 3 pancakes, 2 eggs, 2 strips of bacon or 2 sausage links. Add chocolate chips or blueberries or add whipped cream and strawberries or blackberries. Substitute Cinnamon Harvest Pancakes for any pancake meal for a healthier option. 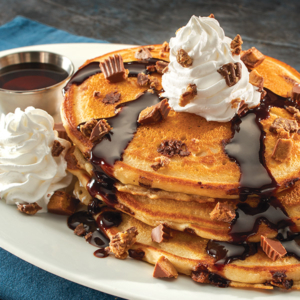 Savory pancakes blended with chopped peanut butter cups and chocolate chips, topped with chopped peanut butter cups, chocolate sauce and whipped cream. Three pancakes, two eggs any style, two strips of bacon or two sausage links. “Our Healthier Option” to any pancake. Made with warm aromatics of cinnamon and rich harvest grains of rice, corn and wheat. Three slices of French toast, two eggs any style, two strips of bacon or two sausage links. 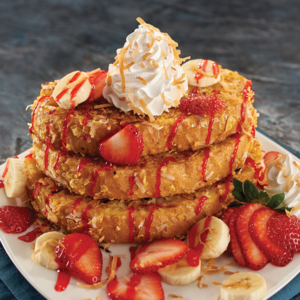 Three slices of sourdough bread battered and grilled with Frosted Flakes and toasted coconut, topped with sliced bananas, strawberries, strawberry sauce and whipped cream. 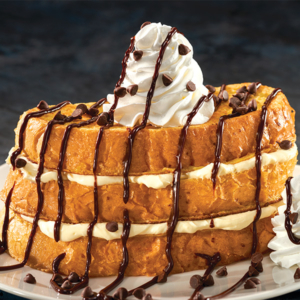 Three slices of sourdough bread battered and grilled, layered with sweet espresso cream cheese and topped with whipped cream, chocolate sauce and chocolate chips. Three slices of Jenny Lee Cinnamon Swirl Bread, battered and grilled to sweet perfection. Fluffy, house-made Belgian waffle, two eggs any style, two strips of bacon or two sausage links. Belgian waffle and two pieces of crispy fried hand-breaded chicken tenders. Topped off with maple or blueberry syrup. 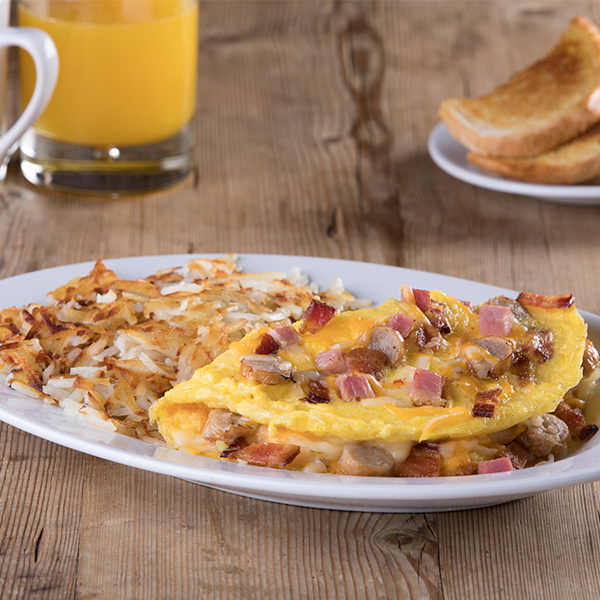 Served with hash browns, home fries or fruit cup. 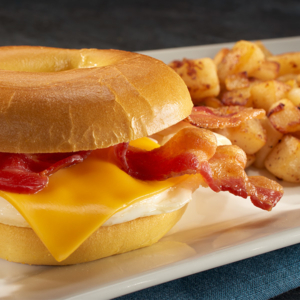 Fried egg, American cheese and sliced ham, bacon strips or a sausage patty served on a toasted breakfast bagel. 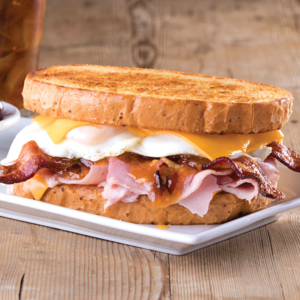 Savory bacon, sliced ham, two fried eggs, apricot-bacon jam and American cheese served between two slices of toasted sourdough bread. Served with side of salsa. 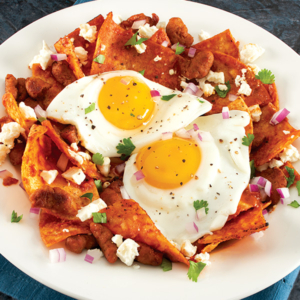 Fresh tortilla chips with house-made ranchero sauce topped with two eggs any style, chorizo sausage, queso fresco, fresh cilantro and red onions. Three scrambled eggs with crumbled chorizo, fresh made pico de gallo, and pepper jack cheese. Served with choice of breakfast meat, breakfast potato and toast. Two tortillas with black bean spread and fresh avocado stacked with two eggs any style, queso fresco, fresh cilantro and house made ranchero sauce. Served with choice of breakfast potato. Fresh broccoli, mushrooms, green bell peppers, red skin potatoes and sliced fresh avocado. Topped with two eggs any style and choice of toast. Italian sausage, kielbasa, chorizo and bacon served over green bell peppers, onions, red skin potatoes and melted Cheddar Jack cheese. Topped with two eggs any style and choice of toast. 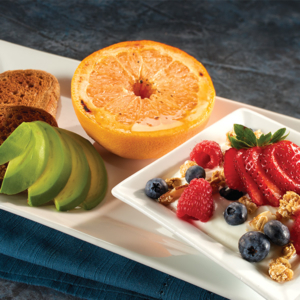 Rich Greek yogurt topped with fresh berries and toasted granola, served with a side of wheat toast, fresh avocado and grilled grapefruit. Smashed fresh avocado served on two slices of whole wheat toast, topped with two eggs any style and grilled tomato slices. Served with two pieces of turkey sausage. Egg whites, diced tomatoes, broccoli, and feta cheese. Served with a toasted English muffin and grilled grapefruit. Steel-cut oats with brown sugar, granola and topped with maple syrup. Served with a side of toast. Steel-cut oats, blueberries, ground flax, toasted coconut flakes and almonds. Served with a side of toast. Grilled ham slice 4 oz.